Arrival in Moscow. Meeting with guide and transfer to the hotel. Overnight. Breakfast. Sightseeing tour of Moscow. Excursion to the Kremlin and to the Armoury Chamber. Visit to the Red square with view of St Basil Cathedral. Overnight. Breakfast. Free time. Transfer to Yaroslavsky Station for departure for Krasnoyarsk. Arrival in Krasnoyarsk. Transfer to the hotel. Sightseeing tour of Krasnoyarsk. Overnight. Breakfast. Excursion to the National Reserve “Krasnoyarskiye Stolby”. Lunch. Excursion to Yenisei Hydro Power Station. Free time. Transfer to Railway Station. Train to Irkutsk. Arrival in Irkutsk (in the evening). Transfer to the hotel. Overnight. Breakfast. Sightseeing tour of Irkutsk. Excursion in Decembrists Museum. Departure for Lake Baikal. Excursion to the open-air museum Tailtsi. Arrival in Listvyanka. Excursion in Limnological Museum (Baikal Lake museum). Walk in Listvianka withvisit to the fish market. Return to Irkutsk. Overnight. Breakfast. Departure for the excursion along Trans-Siberian Railway to Slyudyanka. Tour around Slyudyanka, visit to the Marble railway station. Train by Old Railway along Lake Baikal shore to the port Baikal with photostops. Ferry to Listvyanka. Transfer to Irkutsk. Overnight. Breakfast. Transfer to the railway station. Arrival in Ulan-Ude. Transfer to the hotel. Sightseeing tour of the city. Excursion to the Ethnographical museum. Overnight. Breakfast in the hotel. 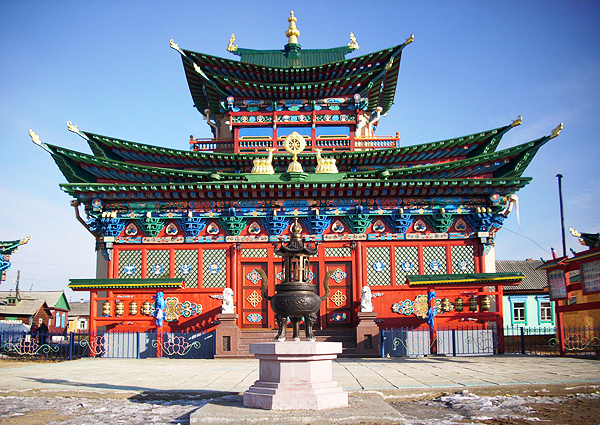 Excursion to Ivolginsky Datsan. Transfer to the railway station. Departure to Vladivostok. Breakfast. Arrival in Vladivostok. Sightseeing tour of the city. Excursion to the Submarine. Visit to the observation platform. Bout-trip in the Amur Bay. Overnight. Breakfast. Transfer to the airport. Flight to Moscow. Transfer to the hotel. Overnight. Breakfast. Excursion to Sergiev Posad. Visit to Troitse-Sergieva Lavra. Return to Moscow. Overnight. Breakfast. Transfer to the airport for departure back home.